On Sunday night, millions of viewers tuned in to watch the much-anticipated season premiere of AMC’s Mad Men. Set in 1960s New York, Mad Men follows the careers and lives of Madison Avenue advertising executives as they negotiate the changing landscape of that mythologized decade. 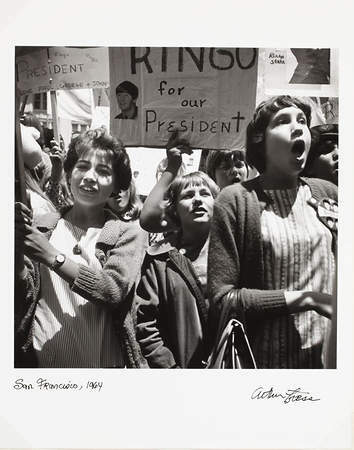 Currently on view at the de Young are three exhibitions that tap into this tumultuous time period: Arthur Tress: San Francisco 1964 (through June 3), New Dimensions: Prints and Multiples from the Anderson Collection (through July 1) and Matter + Spirit: The Sculpture of Stephen De Staebler (through May 13). In 1964, the Bay Area–now defined by its counter cultural tendencies–witnessed the rise of political activism on its college campuses, including the University of California, Berkeley and San Francisco State College (now University). 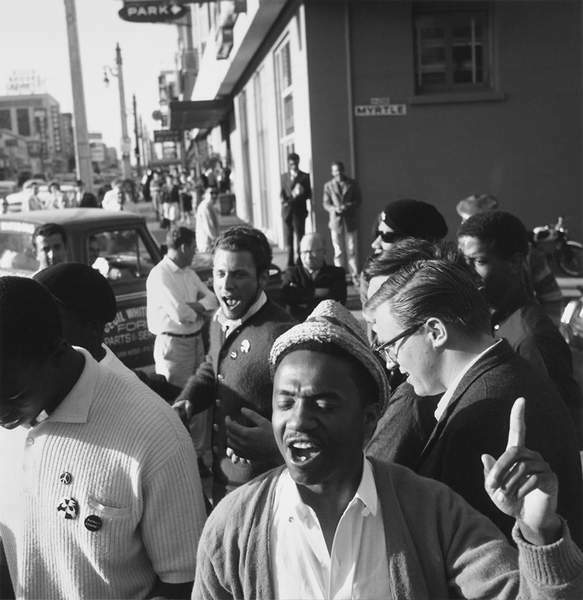 Working with representatives from the NAACP, college students initiated a series of nonviolent protests against racially discriminatory hiring practices targeted at various local businesses, including the car dealerships lining what was then known as Auto Row (Van Ness from Clay to Market Streets). During that same year, San Francisco saw both the conservatism of the Republican National Convention (now known as the Goldwater Convention) and the onslaught of Beatlemania, with the band launching its first North American tour at the Cow Palace. 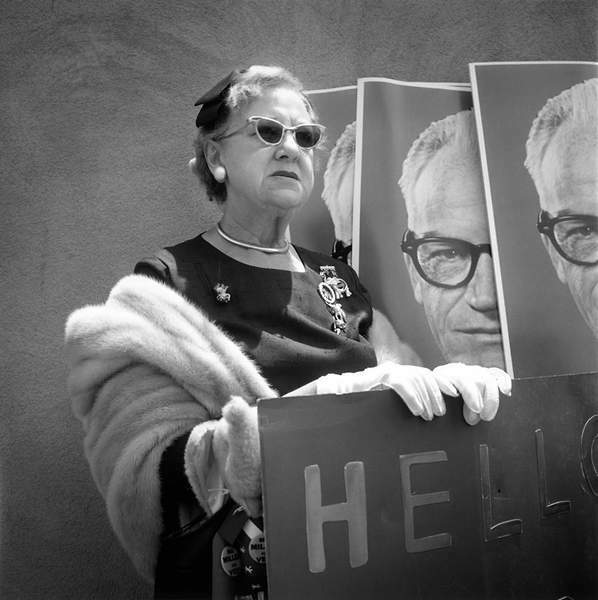 Many watershed moments characterized 1964–including the passage of the Civil Rights Act and the awarding of the Nobel Peace Prize to Martin Luther King, Jr.–and San Francisco’s cultural landscape, as captured by Arthur Tress, was representative of the changing national zeitgeist. As the cultural framework began to shift in the 1960s, so too did artistic production. Perhaps the most well known art movement of the decade, Pop Art was simultaneously a critique and a celebration of a booming consumer age. Nowhere was the symbiotic relationship between art and the market as pronounced as within the area of fine art prints, the focus of New Dimensions: Prints and Multiples from the Anderson Collection. In their subject matter Pop artists like Jasper Johns and Claes Oldenburg engaged with the modern world, finding inspiration in ephemeral consumer goods like the incandescent light bulb and the Chrysler/DeSoto Airflow. These artists also embraced modern industrial processes in their reworking of favorite subjects. 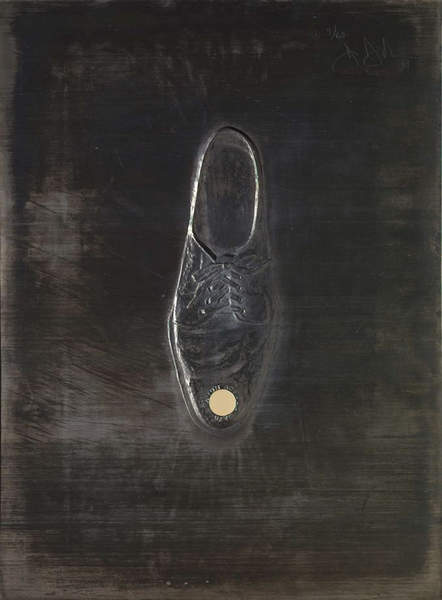 Light Bulb is part of Jasper Johns’s Lead Reliefs series, which he completed in 1969 while working at the print workshop Gemini G.E.L. in Los Angeles. Using motifs such as the light bulb that were familiar from his painted and printed works, Jasper Johns focused his attention during his time at Gemini G.E.L. on new materials, experimenting with the properties of sheet lead to create reliefs that are at once prints and bas-relief sculpture. 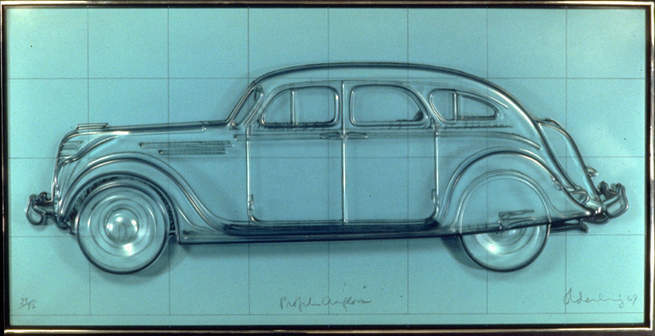 Claes Oldenburg’s ideas to create a lithograph encased in a material “clear in color, transparent like a swimming pool but of a consistency like flesh” led to the development of a type of plastic that could achieve these properties thanks to the perseverance of the expert production team at Gemini G.E.L. along with leaders in the industrial technology research. Profile Airflow is often credited with spurring Gemini G.E.L.’s decision to expand the workshop’s publishing venture to include multiples, or small-scale, editioned sculptures. His iconic subject, the Chrysler/DeSoto Airflow, lends popular appeal to the hybrid-print’s technical innovations, as well. The car—largely considered the first car to be intentionally aerodynamic in form—was a favorite of Oldenburg’s. As a child, he played with a toy version of the car, and when he arrived in Los Angeles to work on his project at the Gemini studio, he was given a life-size car of his own. While social upheaval and the rise of Pop Art are defining factors of 1960s popular culture, the radical changes indoctrinated during that time by the Second Vatican Council drastically changed the experience of religious life for Catholics. Although the sculptor Stephen De Staebler was raised Protestant, his relationship to organized religion remained complex. 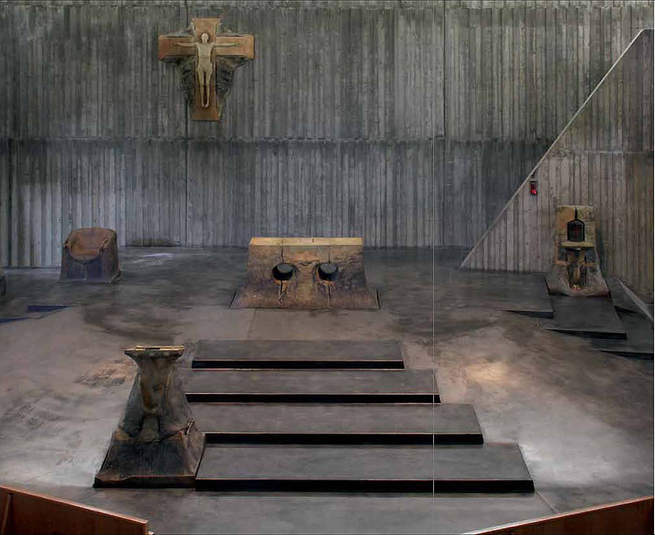 When in 1967–the same year of San Francisco’s famous Summer of Love–he was commissioned to design the sanctuary of the Holy Spirit Chapel in UC Berkeley’s Newman Hall, De Staebler confronted his questions regarding organized religion. One of the primary design principles of this setting revolves around the dissolution of the traditional hierarchical division between the congregation in the pews and the clergy in the sanctuary. Rather, in keeping with the decade’s emphasis on anti-establishment modes of living, De Staebler created a communal and egalitarian environment in which to worship. 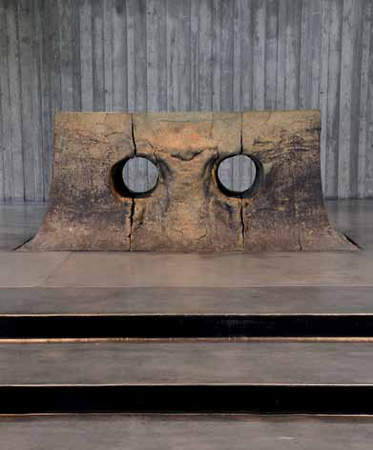 Moreover, De Staebler’s explicit and implicit references to earth mounds, caverns, fissures and streams in the Holy Spirit Chapel coincided with the expansion of the environmental and “back to the earth” movements, which were especially prevalent in California during the 1960s. Perhaps the most direct reference to doctrine handed down from the Second Vatican Council can seen in the perforated altar. These liturgical reforms included the promotion of celebrating Mass at a centrally located spot within the church, rather than directly in front of the tabernacle–this led to De Staebler’s decision to position the altar as the sanctuary’s focal point. Obliquely, the transparency of the altar afforded by the two circular holes, which allow the priest’s legs to be seen, may refer to the Catholic Church’s call to be more open to its followers. So if you think that the Sixties are all pillbox hats and flower children, think again. Visit the de Young to see this extraordinary trio of exhibits that touch on a decade that continues to intrigue, confound and seduce the nation. Arthur Tress: San Francisco 1964 is on view through June 3; Matter + Spirit: The Sculpture of Stephen De Staebler can be seen through May 13; and New Dimensions: Prints and Multiples from the Anderson Collection will be on display through July 1. This post was produced in collaboration with curators Timothy Anglin Burgard, James Ganz and Colleen Terry. Further reading: Arthur Tress: San Francisco 1964 and Matter + Spirit: The Sculpture of Stephen De Staebler.